The Eden Alumni Association was organized in April 1983, with 14 alumni present. In June of that year, we had 250 members at the first Reunion Dinner in the High School cafeteria. We continued to grow. Each of the next three years we gave two $350.00 scholarships. 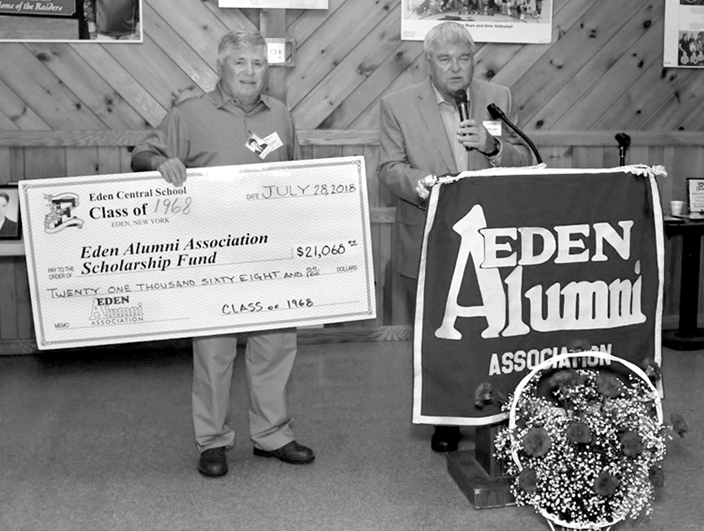 Thanks to the generosity of our members, the Eden Alumni Association is the largest scholarship contributor to Eden students. We also hold alumni events such as Alumni Weekend – be sure to save the date for July 26-27, 2019! Your Alumni Association is now a 501(C)(3) Organization. You are now able to deduct your donations to the Scholarship Fund, the Memorial Fund, and the Alumni Walls in the form of Bricks or 12×12 Blocks from your income tax. The Eden Alumni Association, Inc. has been granted tax exempt status under Internal Revenue Service Code Section 501(C)(3). This status is also retroactive to 1997. This has been a difficult and lengthy process and we have had to formally divide our Association into two organizations. The Eden Alumni Association, Inc. is the group dedicated to collecting and funding scholarships, while the Eden Alumni Society, Inc will handle will handle the social events such as our yearly Alumni Weekend events and membership dues. Alumni events and membership dues are NOT deductible on your income taxes. We will maintain separate bank accounts and accounting ledgers and there will be two separate Boards of Directors, but for all outward appearances, everything will look and act the same. Our main mission will be as it has always been, funding scholarships for Eden students and maintaining an association which brings together Eden Alumnus from all over the country.